Is breakfast the most likeable meal of the day? I think it might be. Or, maybe I’m just a really big fan of eggs and the myriad ways they can be prepared. So, the new book Egg Shop: The Cookbook , of which I received a review copy, was sure to be a winner to me. It’s from the New York City restaurant that came about because of a love of egg sandwiches. And, there’s even more to like about this book and restaurant beyond the breakfast menu. There’s a real commitment to best-quality ingredients and a made-from-scratch approach. Of course, you can choose how many items you prefer to make yourself rather than buy, but all the recipes are here for the breads and rolls, cold-press coffee and chai concentrate, nut milk, homemade bacon, pickles, aioli, flavored oils, and more. The recipes range from indulgent to lean and nutritious. After a chapter that covers basic egg cooking and some classic ways to use those cooked eggs, there are sandwiches, bowls, California-inspired dishes, snacks and sweets, and drinks. Did I mention that everything in this book looks like something you’ll love eating? It does. I’ll be trying the Egg Salad Sandwich made with yogurt in the egg salad rather than mayonnaise. This sandwich is layered on multigrain bread with sliced tomato, baby greens, and an optional piece of boneless fried chicken. The Duck Confit Banh Mi topped with a sunny side up duck egg and the Cognac-Cured Gravlax sandwich on seeded rye are two others on my to-try list. On the lighter side, the Warrior One bowl is composed of sweet potato and broccoli salad, Masala lentils, sliced almonds, onion chutney, and a poached egg. And, from the California-inspired dishes, I’m always drawn to Huevos Rancheros. Here, it’s made with Black Bean Smash, a homemade Salsa Ranchera, crispy blue corn tortillas, and salsa-basted fried eggs. Every recipe has considered components lending great flavors and special touches that seem to guarantee deliciousness. I knew the smoked whitefish sandwich would be a savory thrill with all the parts that come together for it. First, the sandwich is built on an “everything” biscuit. The toppings from “everything” bagels are here applied to a buttermilk, drop biscuit. The biscuits are baked until a few minutes from being done, and then they’re pulled from the oven, given an egg wash, sprinkled with the toppings, and put back in the oven to finish. That delayed topping procedure prevents any burning of the onion flakes, sesame seeds, etc. The smoked whitefish spread was full of big flavors and several things that could be homemade or not. The whitefish was skinned, boned, and flaked. Rather than making a caramelized onion aioli from scratch, I caramelized some local leeks and added them to store-bought mayonnaise. Also, rather than making my own hot pickles, I used a locally-made, spicy, fermented pickle. For the caperberry mustard, I chopped some rinsed and drained capers and added them to Dijon mustard. The other ingredients in this spread were minced green onion, chopped celery and leaves, zest and juice of a lemon, and a pinch of cayenne pepper. 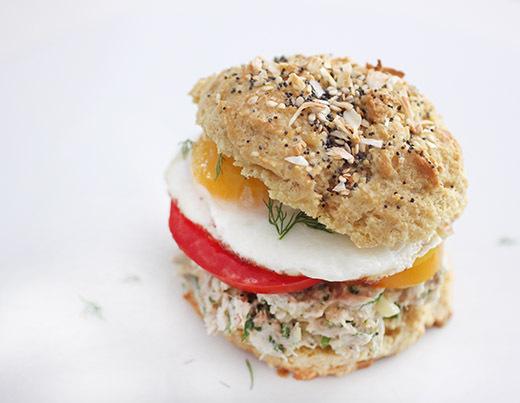 To build the sandwich, biscuits were cut in half and spread with the whitefish mixture, sliced tomatoes were added, a fried egg went on top, and a sprinkling of dill completed it. I can assure you this sandwich did not disappoint. The everything biscuit will be the kind of biscuit I bake most often from now on. 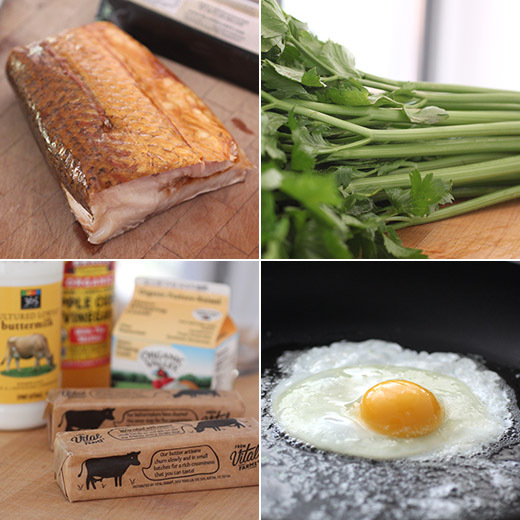 It made an excellent delivery system for the smoked whitefish schmear and all its tangy, bright flavors. Perfect, local, summer tomatoes and a fresh farm egg rounded the experience. Having breakfast for dinner will come in handy with so many more egg dishes I can’t wait to try. I am a breakfast person..and usually need a 2nd breakfast as I am an early riser. 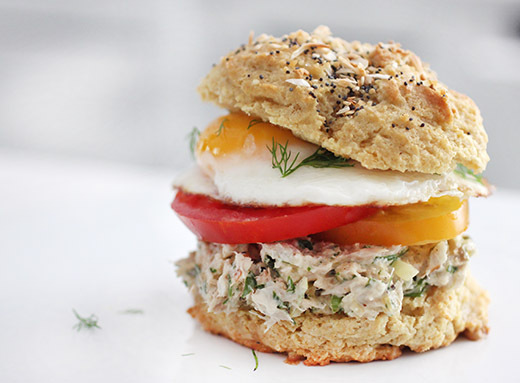 This biscuit sandwich looks heavenly. That white fish mixture would be great to spread on some rye bread too. This looks amazing! I can't wait to try that biscuit. Love breakfast! Although I'm actually more a breakfast for dinner type -- can't eat a big meal early in the day. Sounds like a fun book -- thanks. Oh my! This is indeed a gourmet breakfast sandwich... it looks fabulous! This cookbook looks like a winner! Wow Lisa, what an amazing sandwich...and yes, I am loving the "everything" in it! look really good and delicious ! !